Alterra Coffee Roasters is now a Flavia / Mars Drinks brand! The Alterra Coffee House name popular in the Midwest is now available in the awesome Flavia filterpacks but with the Alterra Coffee name! These unique freshpacks have been around since 1981 and brew a single cup of high quality, gourmet coffee within seconds in the amazing Flavia Drink Station coffee & tea brewers. 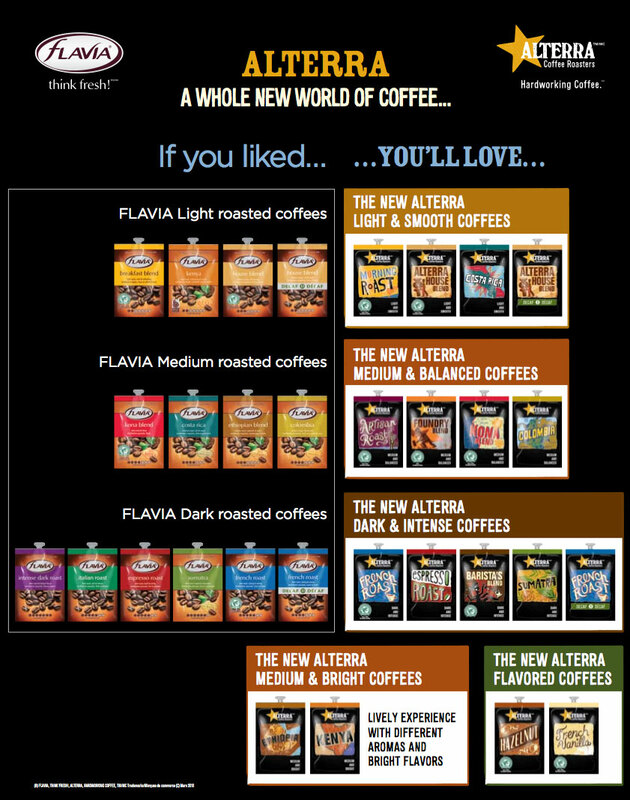 Alterra has a great selection of Light to Dark Coffees, Smooth to Intense tastes, and Bright to Balanced coffee profiles! Mix your favorite Alterra Coffee with a cappuccino or frothy mocha for an addictive treat that will impress the most finicky coffee snobs! Here is a list of the awesome new flavors!!! Instead of the numbered scale to describe strength, the new flavors will be described by Roast & Taste! For example, a roast on the scale like this would be called "Medium & Bright"